We have been thrilled this season to learn how many people are interested in knowing how we grow the food they are buying from us. I hope that it is obvious that we are passionate about growing food in a way that doesn’t harm consumers, the watershed, the soil, etc. 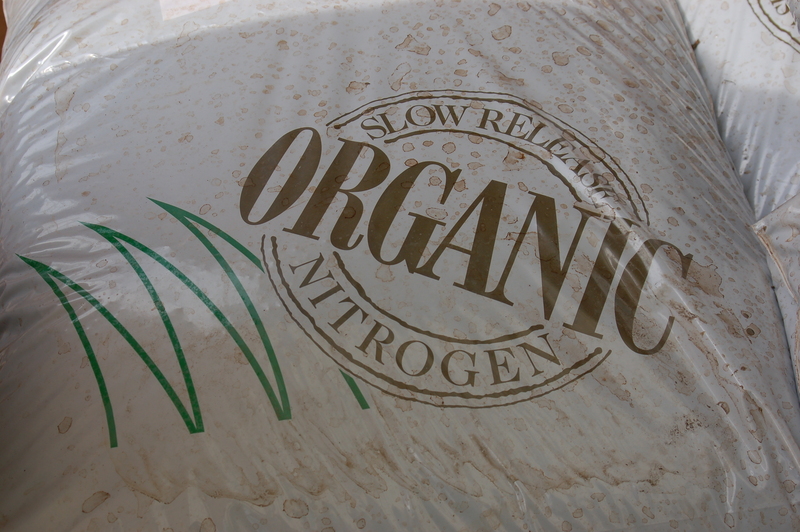 But even though we have a sign at the markets that advertises our use of organic fertilizer and no chemicals, not everyone sees it. A man once walked into our booth after hearing me telling someone what we put on our plants and soil. He said “I’m so glad I overheard you because I won’t go into a farm’s booth unless I see a sign advertising organic practices. You really need to make that obvious to people.” After I pointed out where we advertise it, he said he didn’t notice it there. I’m so glad he stopped to say this! Otherwise I wouldn’t have known that he didn’t see it and that he cared so much. Unfortunately, some growers know what customers want to hear and may falsely describe their growing practices. With so few certified growers in the Richmond market it can get difficult to know exactly what a grower does and uses. So! Here begins our virtual tour of our farm including photos and descriptions of what we put on our soil and plants. I hope many, if not all, of our wonderful customers have a chance to visit the farm some time in the future. Until then, may this virtual tour help you learn about growing food and assure you that all food from Broadfork is clean! We grow cover crops to accomplish various purposes, depending on the needs of the specific growing area (fix nitrogen, break up clay, etc.) If a field hasn’t been cultivated before, we then till it using a reverse-tine tiller (this minimizes disruption to the soil structure as compared with a ‘traditional’ tiller). 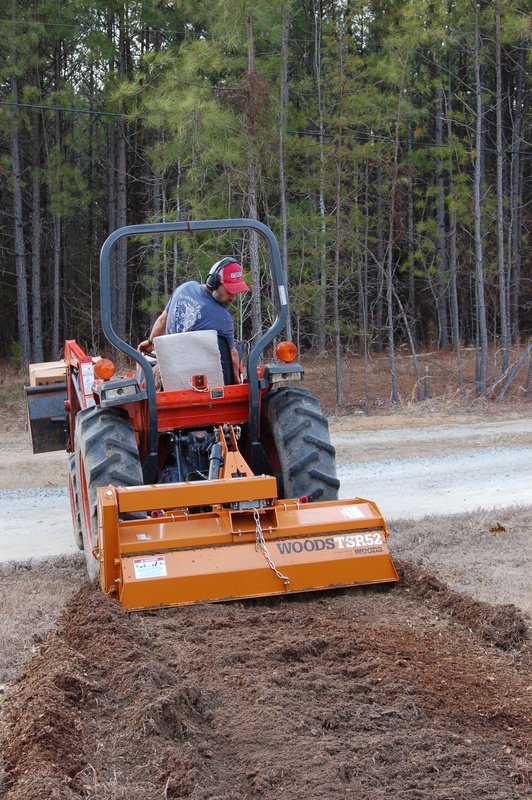 We grow in raised beds, which are shaped after tilling by an attachment to our tractor that Dan put together. 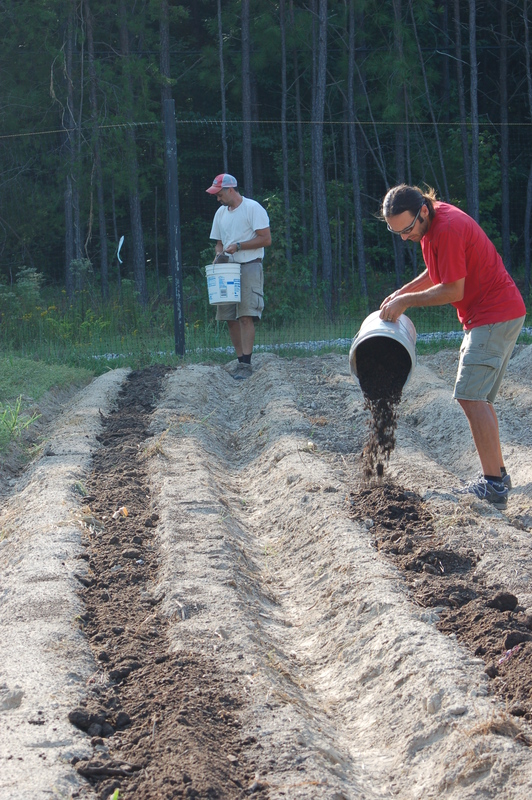 In the photo above, Dan is spreading organic fertilizer by the cupful (rather than bucket-ful). 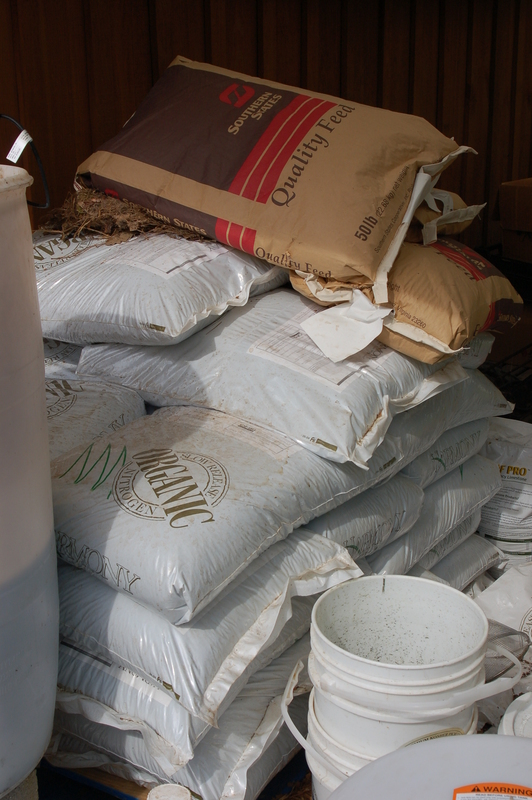 We purchase a chicken-manure based, organic fertilizer made by Harmony to supplement our compost. A little goes a long way. 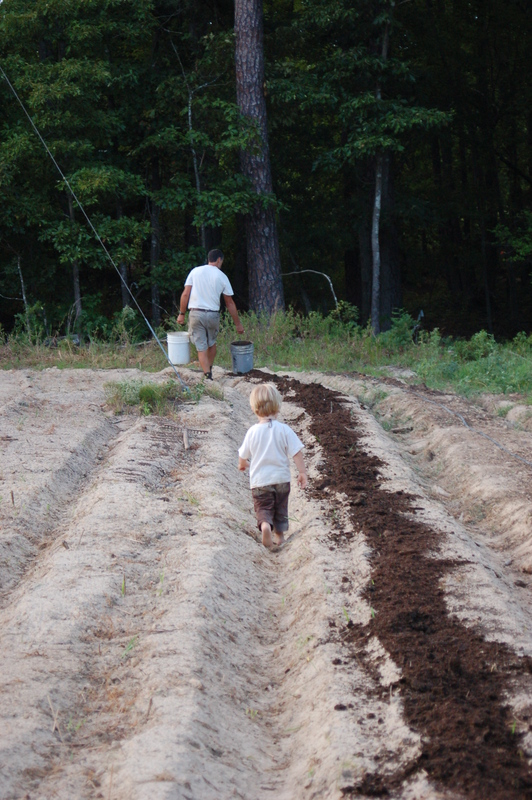 We are a very small farm, but even on our small scale it takes a mind-boggling large amount of compost and fertilizer to spread across our fields. This picture above is of about 1/3 of one of our five fields we currently use. Our fertilizer inventory mid-way through the season looked like this: We also use alfalfa as a soil amendment (in the brown bags pictured on top). After beds are prepped, plants go in. 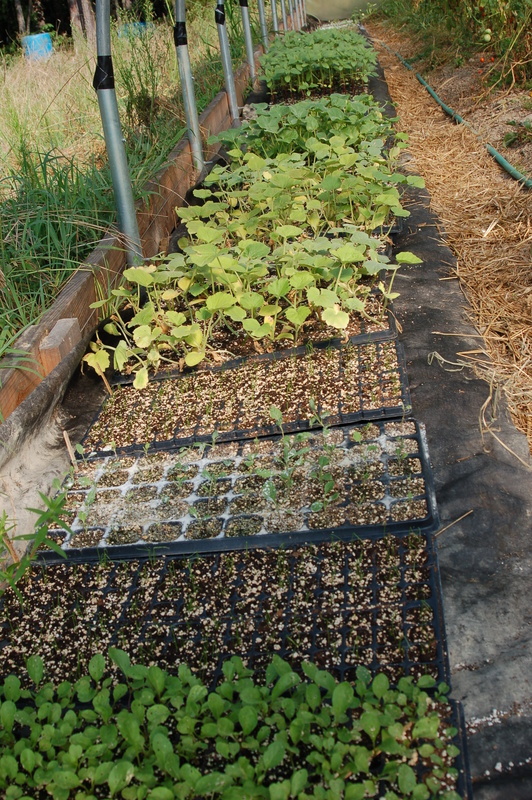 We start in trays. Here are some of the plants for the fall. They’ll be going in the ground soon – anyone want to help?? 🙂 For pest problems, we use a combination of methods: rotating crops through different fields in different years helps stay ahead of pests that reside in the soil – like potato bugs. Attracting beneficial insects that prey upon pests is a favorite method. Parasitic flies, praying mantis’, and lady bugs are obviously friends here. When the bugs are just destroying our plants, we use a few methods allowed by national organic standards: BT, Neem Oil, Castile Soap. But any applied substance has drawbacks (resistance build-up, potential harm to other insects, the expense of labor and materials, etc.) so our preference is to minimize this practice through crop rotation, attracting beneficials, and planting pest-resistant varieties. 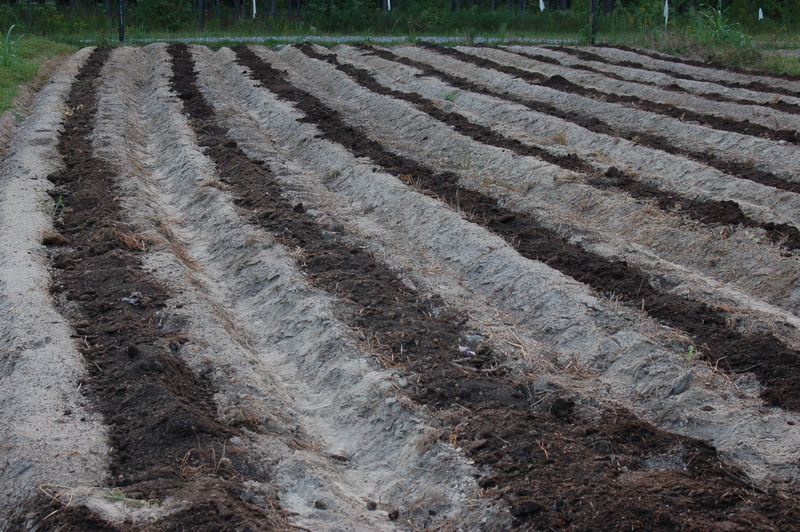 This year the squash bugs have been enormously challenging, but the potato bugs were manageable. We will see what next year brings. I hope this helps shine some light on small-scale, sustainable agricultural practices. If you have questions, feel free to ask Dan or me at market, and try to make it to our Pizza Night on October 1st to see the farm for yourself and enjoy a delicious pizza baked in our wood-fired outdoor oven! Are you happy with the ability of your reverse tine tiller to work in Green Manures. 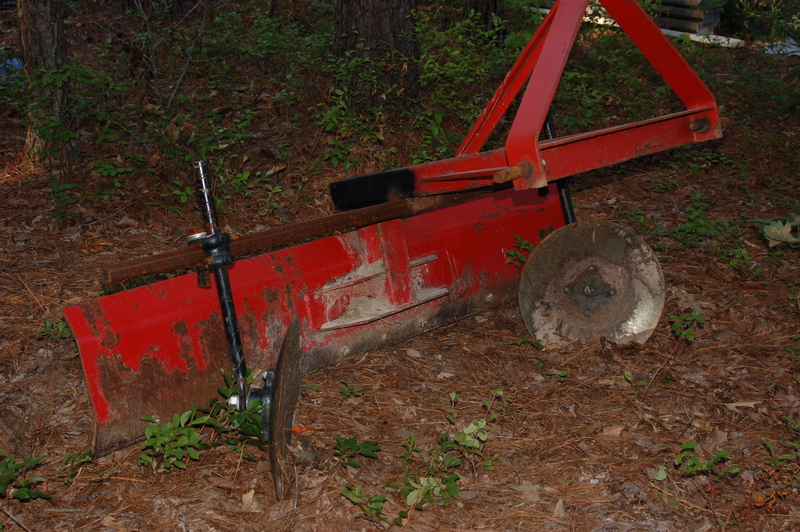 I am depating wether or not I should get a forward rotational tiller or a reverse tine tilller for our small market garden farm. I am happy with it. I have no experience with the forward rotational (but i don’t think there would be much difference). Certainly needs a few weeks for the green manure to break down before have a seed bed for direct sowing. I have used it in clover, winter rye, & sudangrass (sudangrass mowed first). Thanks for the reply to my question on reverse tine tillers. Have a great late winter.